Overview: Just in time for the Halloween scary season we have a colourful new 40 pay-line, 5 reel video slot with multiple reward opportunities. Come and mix it up with the rock 'n roll witch, whacky werewolf, garish ghouls and a host of other zany characters in a slot that delivers quivering sounds, a second screen bonus game generous free spins, spooky-smooth action and for the fortunate some significant rewards. Rack up 3, 4 or 5 blue lamps and watch the free spins and major multiplier impact on winnings unfold in an exciting new game dimension recorded on the accumulative bonus meter. And when 3, 4 or 5 bats flit onto the display, hang on for a real trip - there's the possibility of up to 100 times winnings and admission to the second screen bonus feature called Fat Bat Bonus. With potential multiplier power of up to 60X. 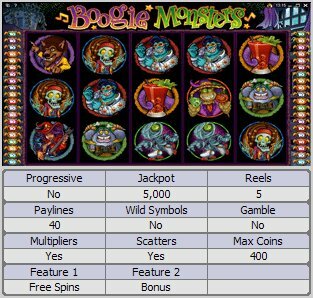 Boogie Monsters combines the best of second screen bonus thrills with the very popular free spin gaming concept, delivering a truly entertaining major video slot. Similar Slots: If you like Boogie Monsters, you might like these other 5-reel slot machines: Arctic Fortune, Chain Mail, Mad Dash, Mega Moolah 5 Reel Drive, My Slot Video Slot, Spring Break.